This week we began our ‘overnighters’ to begin adjusting to the altitude we’ll encounter in Peru. Parts of our trek will reach upwards of 15,000 ft. Physically, we’re more than ready for the daily demands of 12+ mile hiking. The objective at this stage is to get our lungs and hearts ready for the drastically lower levels of oxygen. Day 1 of our altitude training happened to be on Summer Solstice, and a near full moon. We decided that the best place to take it all in would be Cucamonga Peak. We began late in the day on Friday, when both of us had gotten off from work. 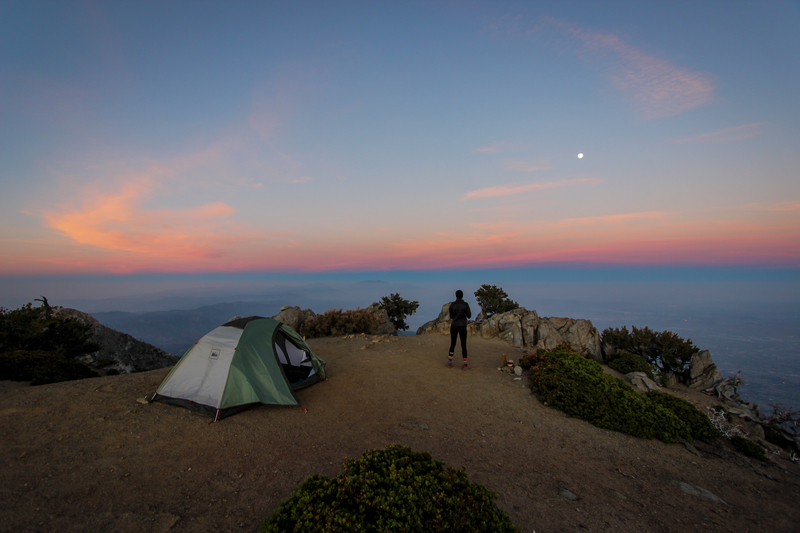 We made it to the summit just before sunset, and claimed our prime real estate at the summit of Cucamonga. The Summer Solstice sunset was spectacular, and the moon shone so bright, it cast our shadows all about the peak. Even the weather played nice , as the temps stayed in the low 40’s with minimal wind. did you need a permit to camp at the peak? Only for use of open fires. You just need an adventure pass to park in the Icehouse Canyon parking lot.